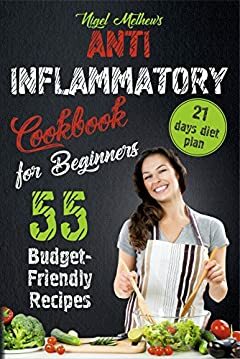 Anti-Inflammation Diet For BeginnersÂ takes a preventative dietary approach to fighting inflammation by stimulating natural healing with anti-inflammatory foods and supplements. It reveals the causes of inflammation and provides a how-to prescription for eliminating it through diet changes, stress reduction, and healthy weight loss. FlexibleÂ anti inflammatory diet planÂ to fit your needs and tastes. TheÂ Anti-Inflammatory DietÂ in 21 days is an indispensableÂ anti-inflammatory diet cookbookÂ andÂ meal planÂ with one goal: to transition you to a healthier lifestyle that supports your immune system. Discover how an autoimmune diet can be easy, convenient and filled with variety and flavor. I look forward to getting you started on some of my most favorite recipes that I've ever shared. Trust me, itâ€™s worth it!